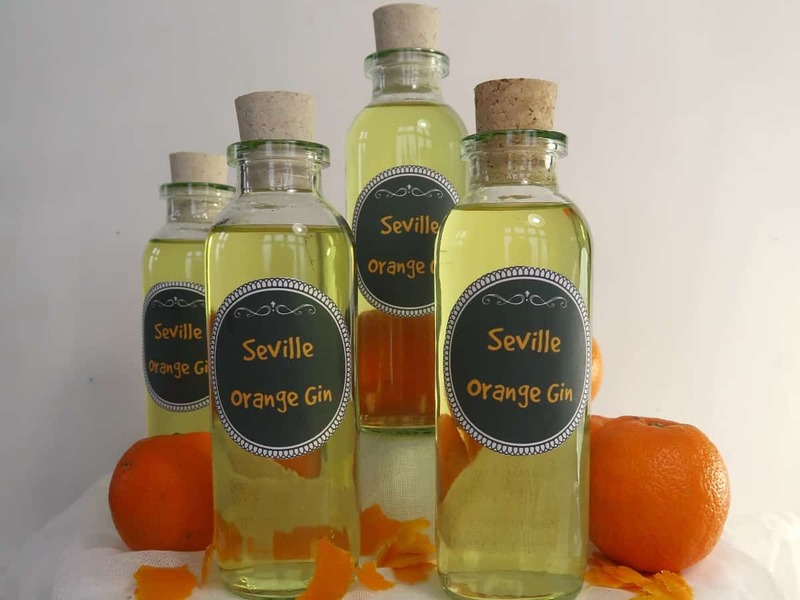 Seville oranges and gin are a match made in heaven. 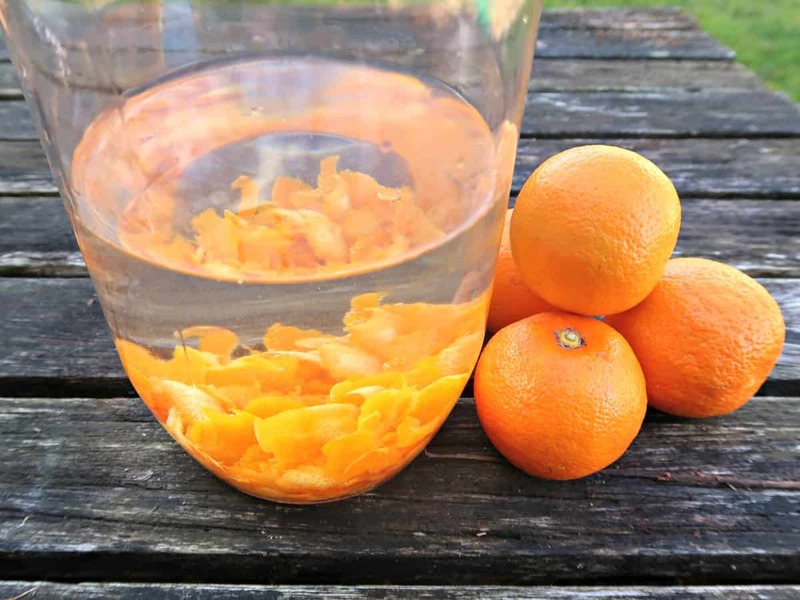 Thanks to the high concentration of aromatic essential oils contained within the zest of this bitter orange, this mouthwatering Seville orange gin infusion is ready in a matter of days. It really is simple to make, and it tastes fantastic. The season for Seville oranges is short, with fruit appearing in the supermarkets in December and finishing in February. So it is worth knowing that these fruit freeze exceptionally well, allowing you to use them throughout the year. 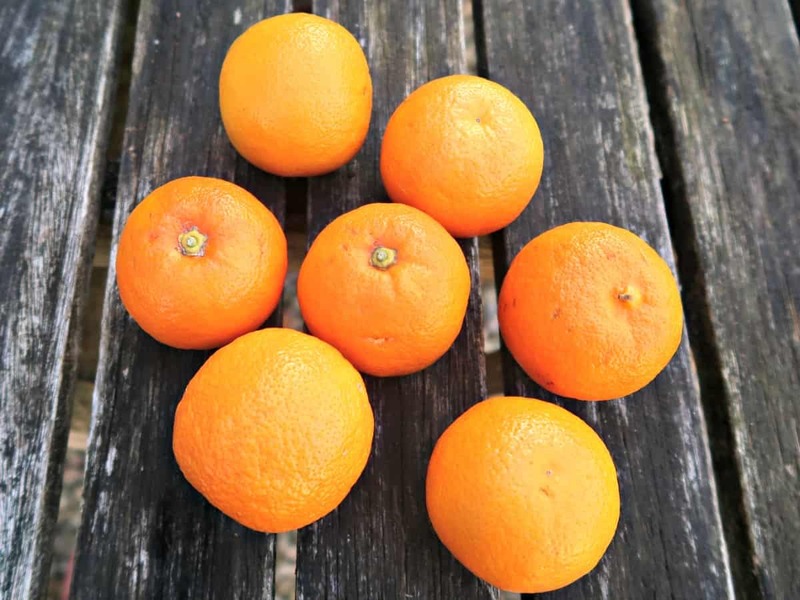 Seville oranges are best known as a marmalade orange, and you can find my recipe for How to Make Amazing Orange Marmalade with Frozen Fruit here. 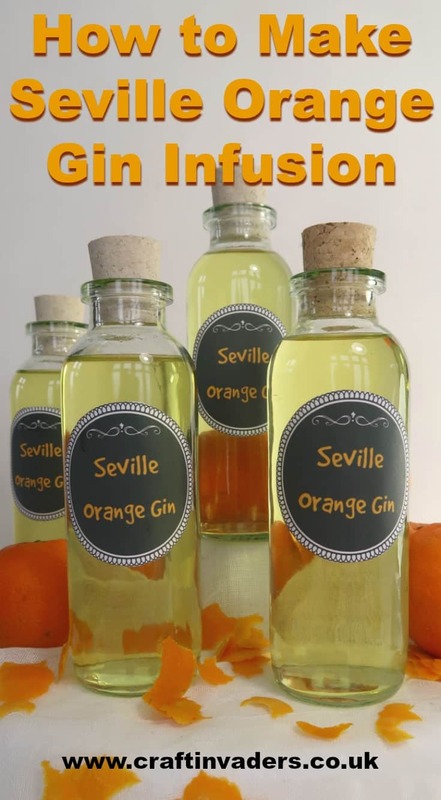 What you need to make Seville orange gin. Sugar syrup made from 100g Caster sugar and 100mls water. Glass Jar (Amazon) big enough to hold the ingredients, that seals well enough that you can get away with giving it a shake without it all leaking out and pretty glass bottles (Amazon) for when it is ready. 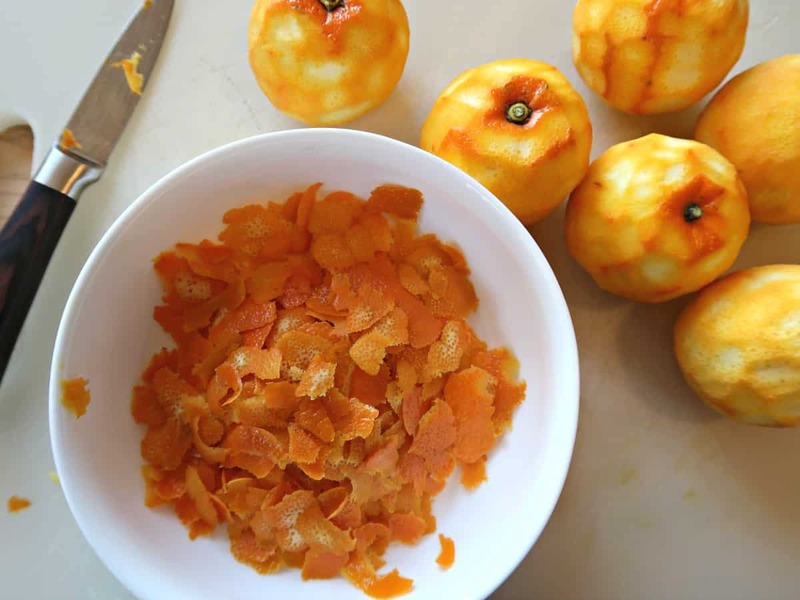 Start by carefully removing the zest from the Seville oranges. I find it easiest to use a paring knife, although there are dedicated zesting tools available. The zest is the outer coloured layer of the peel of citrus fruit that contains the precious essential oils. It is those fragrant essential oils that will flavour the gin. The white inner layer of the skin is called the pith. The pith is bitter so try to avoid removing any of that with the zest. Place the zest into the glass jar and top up with the Gin. I use supermarket own brand London Gin. I don’t bother sterilising my bottles when I make gin infusions due to the alcohol content being high enough to kill any bacteria, so just go for ‘dishwasher clean’. 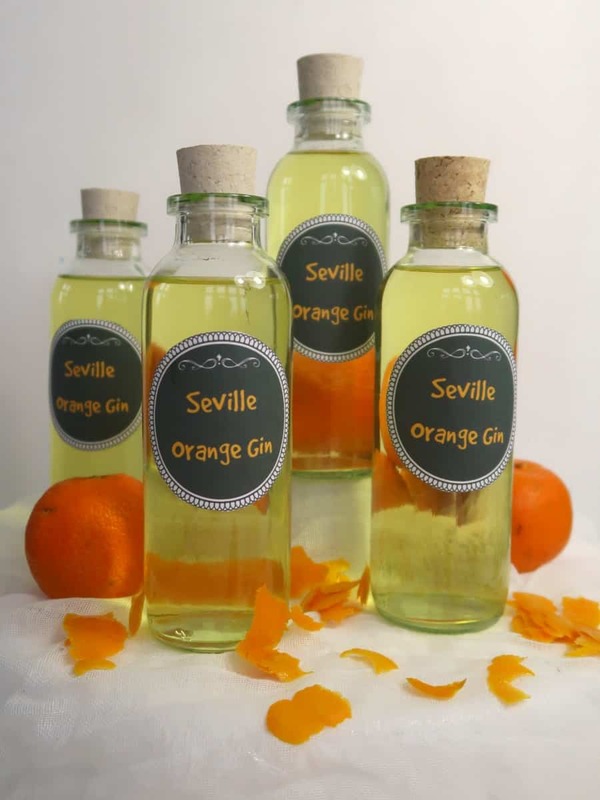 The zest from the Seville orange really is very aromatic, so it’ll start imparting its fragrance and flavour into the gin quickly. I shake my orange gin infusion a couple of times a day and taste it at the same time. This batch infused for 72 hours by which time it had a lovely bitter orange flavour. How long you leave your Seville orange gin is very much down to your own taste. Once the orange gin has infused to your liking, strain out the zest through butter muslin into a clean jug. Heat the caster sugar and water until it dissolves into a sugar syrup and use to sweeten your bitter orange infusion. I used all the syrup to sweeten my Seville orange gin to my taste, but you can add more or less depending on your own preference. Finally pour into clean, glass bottles and label. Seville orange gin should keep for at least a year stored in a cool dark place. We love to make different seasonal gin infusions throughout the year. Our favourites include Raspberry and Mint Gin and Magical Colour Changing Himalayan Balsam Gin in the summer, and Sloe Gin in the Autumn. Linked up at the Fabulous Weekend Potluck.